Kerala, better known as "God's own country", is my native place. Onam is the biggest festival in Kerala, celebrated by one and all, with no religious barriers. It falls during the month of "Chingam" ( August - September ). Various festivities include intricate flower carptes ( pookkalam ), banquet lunch ( sadya) boat races etc. See our previous post about Onam here. As we celebrate Onam, I thought is fun to share some pictures with you all from our recent visit to Kerala. 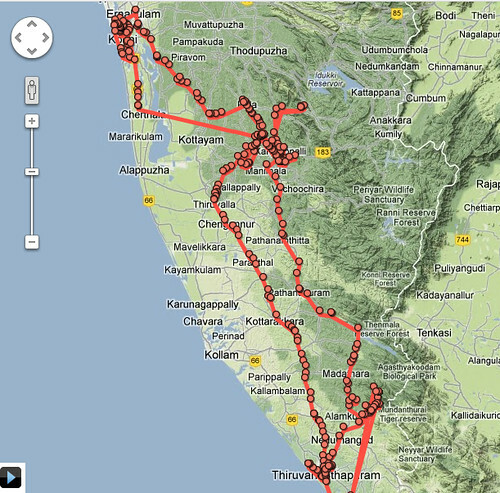 A google latitude screen shot with my locations while in Kerala. 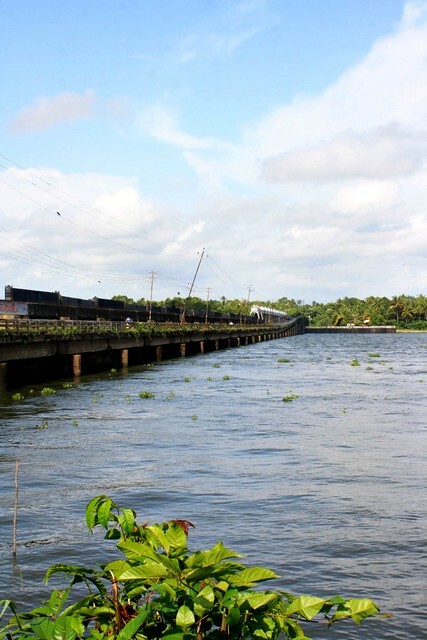 We stayed near Kottayam for most of time, and travelled west, south and east! OK for those who do not know about Kerala - it is a green strip of land on the South Western part of the Indian peninsula. Bordered on one side by the deep blue Arabian sea and on the other side by the lush green Western Ghats hills. My parents live in the central part of Kerala - and we stayed with them. We travelled to Trivandrum , Ponmudi , old Kochi ,Vagamon etc during our visit. That means we travelled from central to the south-most part of the beautiful state. 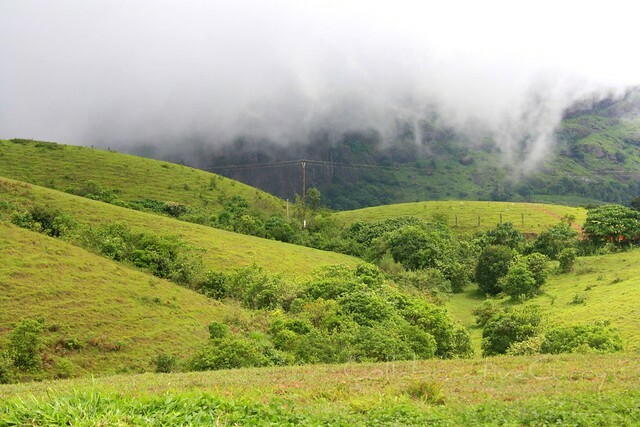 Vagamon is a serene hill station in the Western Ghats, about 25 miles from the place my parents live. 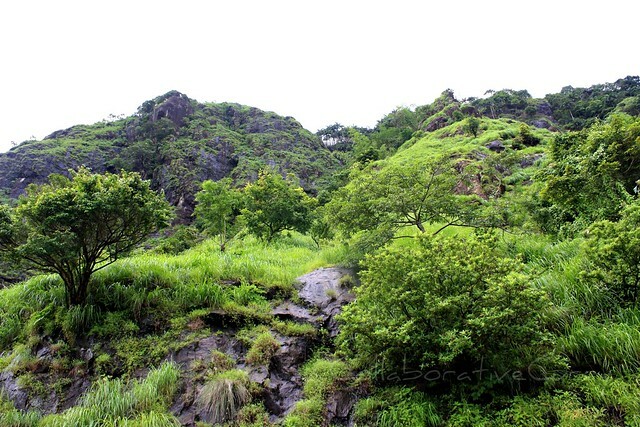 It is at the border of two districts,Kottayam and Idukki. We did a beautiful hiking there in "Kurissummala". "Kurisummala", literally translates to 'The mountain of holy cross'. There is a small church on the top of the hill and we saw many devotees climbing the hill chanting and singing Christian devotional songs. 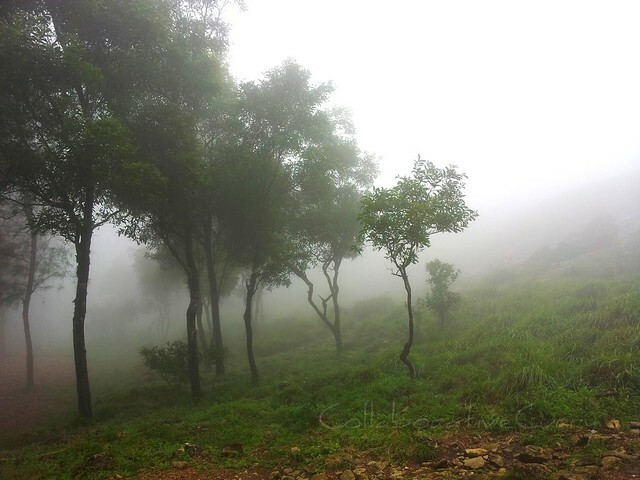 While we turned back we could see the greenery of the mountains lying in layers, partially covered in fresh fog which resembled big piles of cotton. 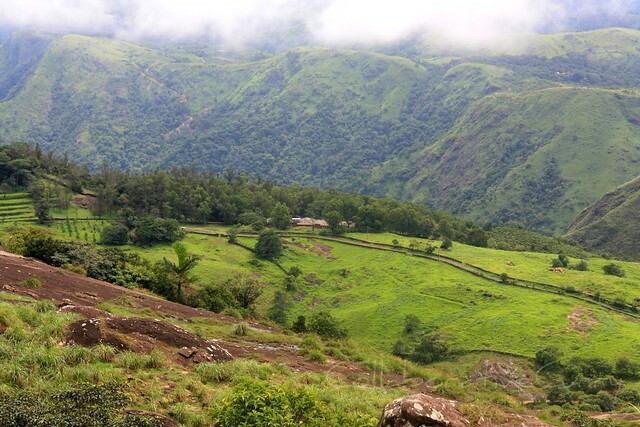 A few miles from Kurissumala, "Vagamon meadows" is a famous destination for those who are into professional photography. So many song sequences in Indian movies have been shot here.These meadows are surrounded by beautiful tea plantations. 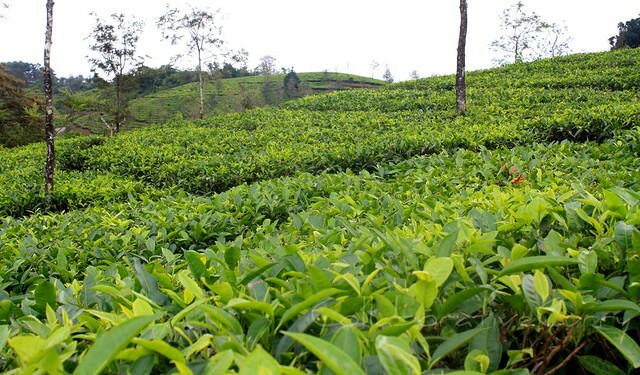 Tea plantations are legacy of the British settlers starting late 1800s. If you know me, you know how much I love mountains. I grew up in a hilly area, maybe that's the reason why I love this place where I live, though it's a different country, and the mountains here in Colorado are far, far different from these green hilly mountains .The major difference between the Rockies and these mountains in Western Ghats is the greenery ! Oh,boy ! It is so green everywhere. This is the only thing I envy about my friends living near the green Appalachians. We can see the plants growing out of the teeny cracks in boulders and a lot of lichens on the rocks. There is LIFE everywhere. When I say everywhere,I mean literally everywhere. We are one of the highly populous state in India. Also the soil is so rich and fine for almost all kinds of cultivation. Heading west from the mountains, we reach the floodplains of coastal Kerala ( the light green patch west of Kottayam in the map). 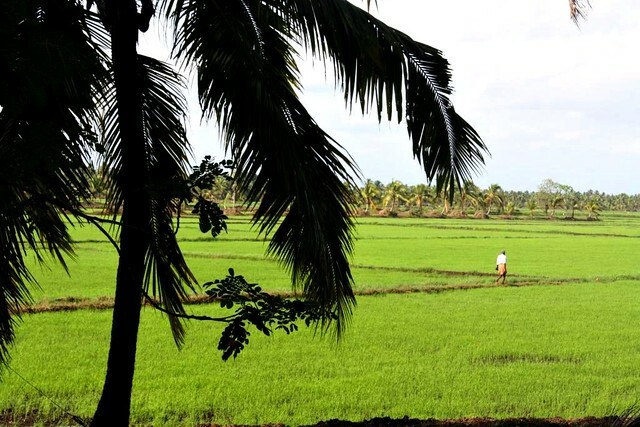 Kerala had a lot of paddy fields, a major part of which is destroyed to make room for the concrete structures and rubber plantations. Still we can see some beautiful paddy fields like this one.This was taken somewhere between Thanneermukkam bund and Kumarakom. 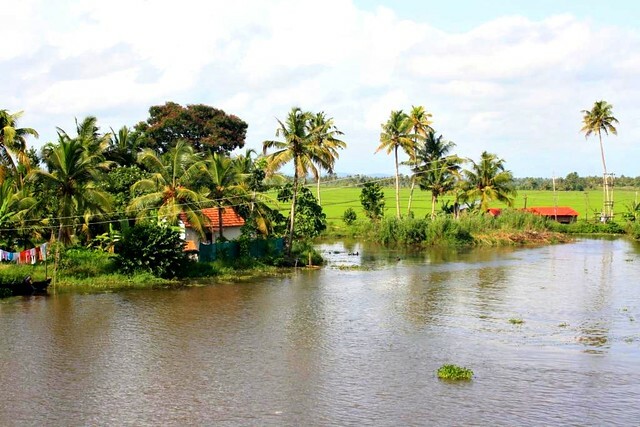 The backwaters and lush green fields, together give a refreshing treat to your eyes and mind. 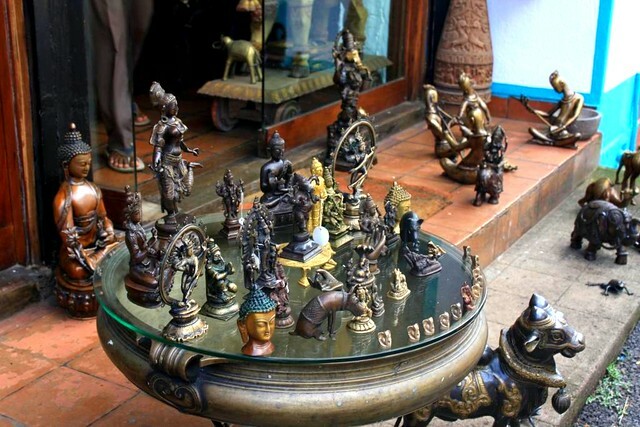 We traveled to Old Kochi and visited the Jew street in Mattancherry and nearby areas. Do you know that Kerala had Christians, Muslims and Jews living in harmony way before 1000 AD? One of the first trade hubs,Mattancherry still houses a lot of spice shops and antique shops on both sides of the narrow street. The trip to the capital city of Kerala,Trivandrum aka Thiruvananthapuram was wonderful ! 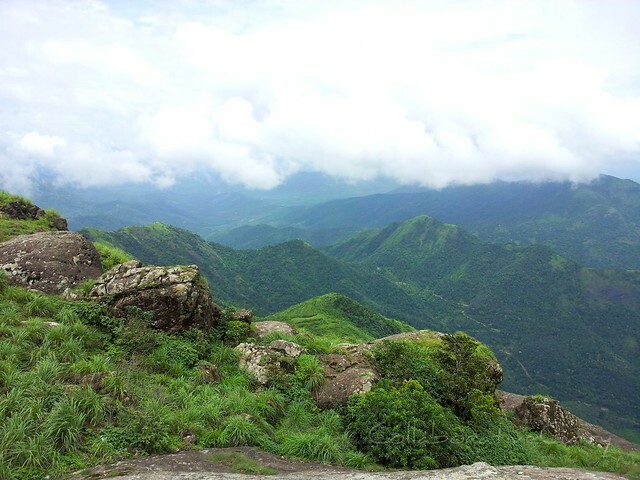 On our way back we went to Ponmudi,another beautiful hill station in Kerala. It was quite foggy since we reached there in the afternoon. 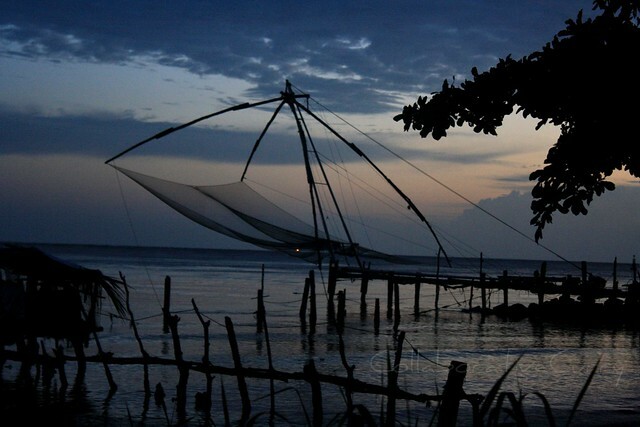 Now you will agree with me on one thing: Kerala is one of the most beautiful places on this planet ,don't you ? Wish you all a very Happy Onam. For making a feast/sadya,please refer to the page dedicated for Kerala sadya recipes ,by clicking here. That was indeed a feast for the eyes. Makes me nostalgic! beautiful clicks. love the fishing net snap the most. Happy Onam to you and family as well Namitha...It was truly a thoughtful post ! Happy Onam to you and your family.. Such lovely pictures, Namitha! I want to visit Kerala so badly! Happy Onam to you and your family! Hugs! 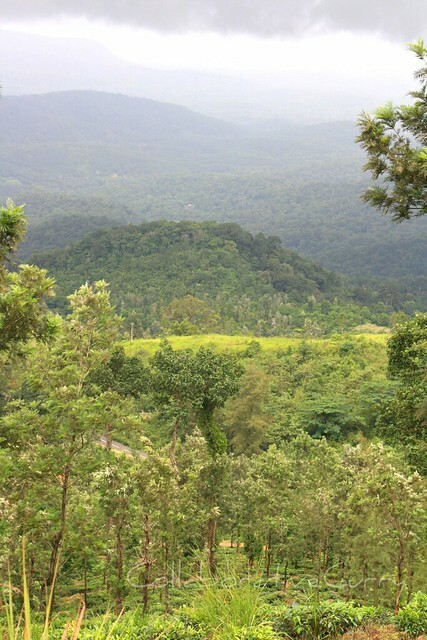 Green green Kerala! Truly God's own country. Onasamsagal to all of you. Wow. Beautiful pictures! 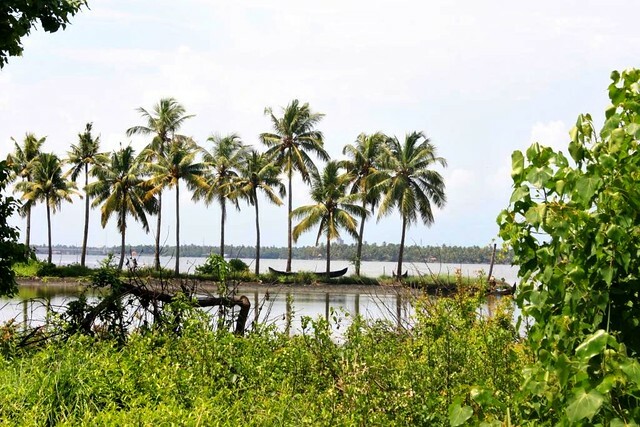 Looking at those pictures, I can see why Kerala is considered God's own country. So lush and green. Happy Onam to you and your family! Ente Keralam Ethra Sundaram, aa padathu koode odikalikkan innum kazhinjirunnenkil... You made me homesick Nami, excellent pics and lovely post. Wishing you and family a Very Happy Onam!!!!! Happy onam wishes to you n ur family.. Never get tired of Kerala, green Kerala looks fabulous and eye pleasing. wow - what a lovely place... Would love to visit 1 day! Happy Onam to you too. Awesome pictures Nami.. I don't know why I din't get any good pictures like this..:) Thankyou for sharing these pictures.. indeed a visual treat! Happy Onam to you and family Namitha. I want to visit kerala again.. it is one of the prettiest places on earth. I have been there when I was really little, but still remember some, esp. Trivandrum where we were staying with a friend. and also the shore with fishing boats and nets. Marvelous photographs and thanks for the tour. Iam browsing thrughyr blog nf I love it here. These pics just want me to go back to my naadu so badly. I have always loved the State and I think I shall always do so. Thanks for the pics. 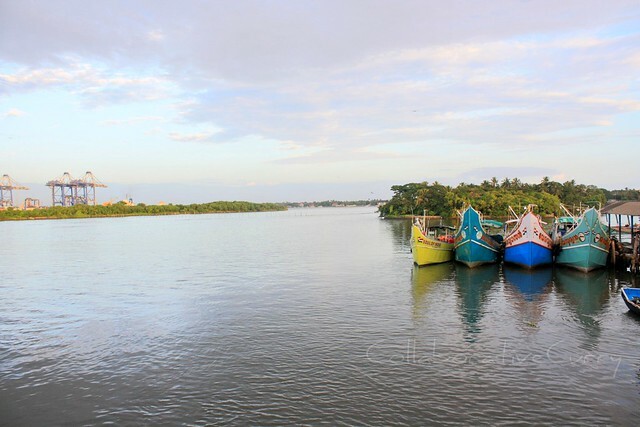 You know that pic of the boats at Kochi is it near the new Port ?? Ada Pradhaman - Happy Onam !